Prior to the FD8k, several GRCers flew westward to Duluth, MN on Saturday for both the Grandma's Marathon and Garry Bjorklund Half-Marathon. Sadly, it appears that Minnesota-born Kyle Wagener brought home a heaping helping of D.C. humidity for race day, and PRs in the longer distances will now need to wait until the fall for the crew. Highlights on the day include Graham Tribble's 1:08:56 in the half as well as Greta Stult's near-PR 3:00:13. As seen below, the Duluth News Tribune captured a great photo of Greta's last race stateside prior to a year-long stint overseas for work. Each year we strive to ensure that the FD8k runs smoothly, but we'd be remiss if we failed to thank our sponsors, supporters, and friends for their continued support of our club. 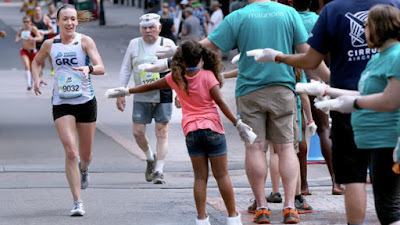 It's not just on Father's Day -- the encouragement we receive year in and year out from the DC running community is paramount to our ongoing accomplishments. Thanks to all for making this year's race a rousing success, and here's to great things to come later in 2017 and beyond!